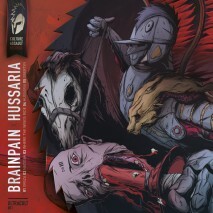 ULTRACULT001 | Brainpain - Hussaria EP | Joomla! With the Hussaria EP we tried to capture a certain part of Jakub's broadness and put it together in to an unique EP covering a historical topic related to his Polish home country's background featuring five stunning and different tracks from epic dark Dubstep to hard hitting snare monsters. We asked the master himself if he could let us in on the plot of this release HUSSARIA, sharing his knowledge about history and music. Brainpain: "Let me give you a short history lesson which is related to this release. Between first half of XVI century to the end of XVII century Poland had the best cavalry unit in history of civilisation. The HUSARIA was heavy, armoured cavalry which was as fast as light eastern cavalry but had a power and armours stronger than western heavy cavalry. The hussars were famous for their huge 'wings', a wooden frame carrying eagle, ostrich, swan or goose feathers. A metal-made horseman's pick called NADZIAK was one of the main weapons of the famous Polish winged hussars.It was often used as a means to penetrate thick plate armour or mail which the standard sword could not. The Battle of ORSZA was fought on 8 September 1514 between the allied forces of Lithuania and Kingdom of Poland and the army of Moscow.The much smaller army of Poland–Lithuania (under 30,000 men) defeated the 80,000 Russian soldiers, capturing their camp and commander. The Moldavians lost approximately 7,000 cavalry killed, 1,000 prisoners taken and the loss of their entire artillery train of 50 guns. The Polish losses were 256 killed. Historical sources say WHERE THE WINGS RIDE not much has been left." Last but not least, we asked our Swedish Blokkoman Marcus Bratkilla what he thinks about when he listenes to this EP. Marcus - diplomatic as we know him: "This includes everything you need to hold an abortion party".